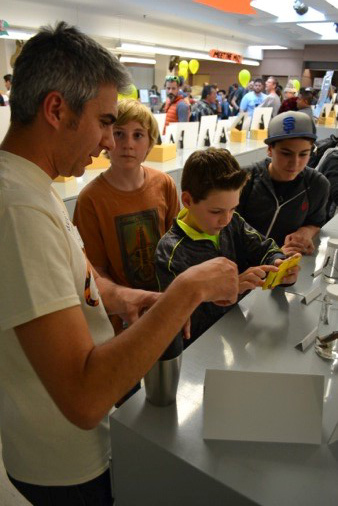 Cal Day at the MVZ is an elaborate, exciting affair that has become a favorite with the Bay Area community over the years. 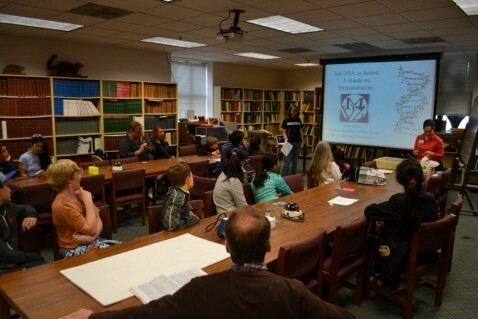 The quality and success of this event is in large part due to the tireless efforts of MVZ's veteran scientist-educator Monica Albe, who has grown the museum's capacity for education and outreach since she began working at the MVZ in 2001. This year, Cal Day (April 12th) was Monica's last official day as an employee of the MVZ, as she has moved on to begin an exciting career as the marketing director for a promising Oakland start-up. We are sad to see her go, but know that she will be keeping in touch with the MVZ community wherever her adventures take her - as many past students and staff have mentioned, the MVZ is a place that sticks with you long after you leave! Monica has left behind a lasting legacy; a strong commitment and passion for science education and outreach that we are proudly striving to maintain in her absence. This Cal Day was somewhat of a transition, with Monica helping me to organize the event so that future MVZ educators will have to tools to put her tried and true plan into action year after year. I'd like to thank MVZ faculty, staff, Post-Docs, students (graduate and undergraduate) and volunteers who helped make this year's Cal Day a success! Following are some key highlights, stories and photos from our big day. Evolutionary Genetics Lab Manager Lydia Smith shows Cal Day visitors how to extract DNA! (Photo by Jeremy Chase Crawford, 2014). MVZ Curatorial Assistants Anna Hiller and Philip Kahn allow visitors to interact with live snakes (Boa constrictor imperator and Aspidites ramsayi). (Photo by Jeremy Chase Crawford, 2014). MVZ Archivist Christina Fidler asks visitors about their favorite camping and hiking spots. (Photo by Jeremy Chase Crawford, 2014). Two hilarious puppet shows, put on by MVZ undergraduates Irene Chang, Anna Hiller, and Sam Parks, along with MVZ Prep Lab Assistant Shelby Medina, MVZ educator Monica Albe, her brother Paul Albe, and Curatorial Assistant Perry Pearson. You can watch the second puppet show, and see the table crashing down during the grande finale here! A DNA extraction demo led by our Evolutionary Genetics Lab Manager Lydia Smith - her DNA extraction demo is so popular with visitors that we get her to come back year after year! An antler craft activity led by MVZ undergraduate volunteers where families could make colorful antler hats depicting native Californian species! An enticing snake dissection put on by Prep Lab Manager Terri Barclay, Prep Lab Assistant and Instructor Shelby Medina, and MVZ undergraduate Maggie Lee. 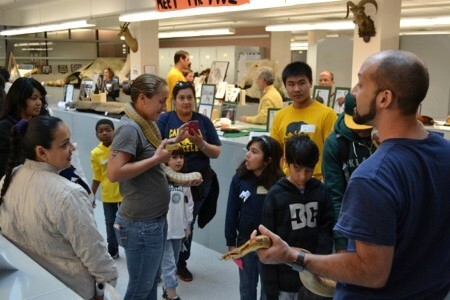 Visitors were mesmerized by the guts and glory and everyone was surprised when it was uncovered that inside the snake were four viable offspring! 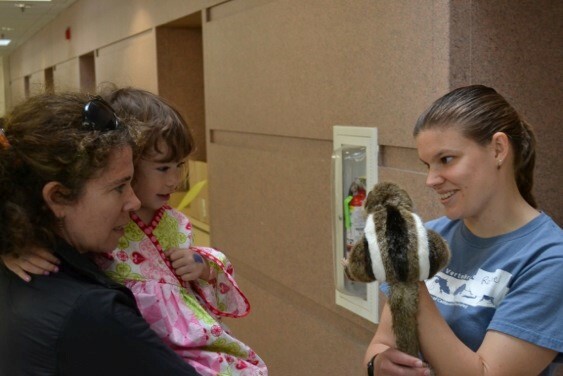 An endearing My Favorite Animal show-and-tell session, where MVZ graduate students Mike Holmes, Beth Wommack, Rachel Walsh, MVZ postdoc Megan Phifer-Rixey, and MVZ undergrad Alexis Barrera related their favorite museum specimens to a family audience. They also shared their personal 'ah-ha moments' - pivotal people, places, objects or events in their lives that motivated them to pursue science as a career. 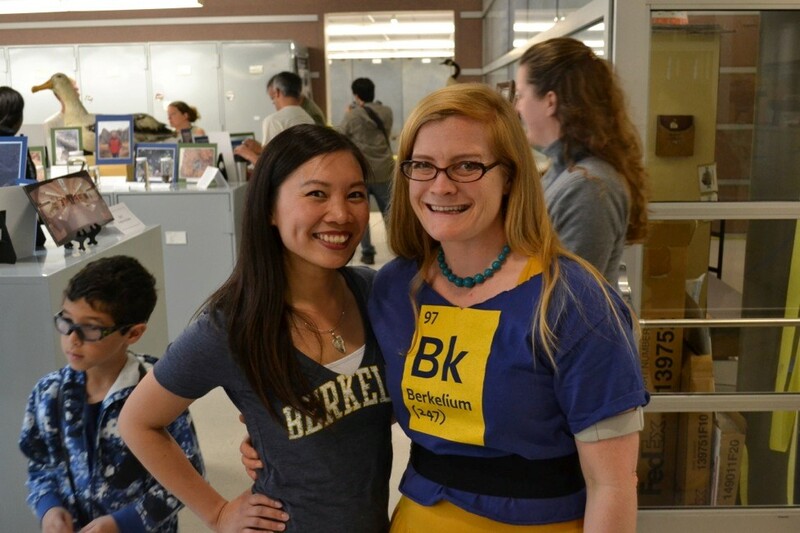 Last but not least, a wonderfully engaging natural history illustration station organized and led by natural history illustrator and Science@Cal Outreach and Education Coordinator Katie Bertsche. Visitors were invited to use pen and water colors to draw or paint specimens out on display. Needless to say, this activity was very popular, especially with young visitors! Katie Bertsche teaching drawing and painting techniques (right), and showing off the wall of natural history illustrations created by Cal Day visitors (left). (Photos by Jeremy Chase Crawford, 2014). The above events, along with many others, were made possible thanks to the tireless undergraduate, graduate and external volunteers who put in the time to spread our love of science to the public! 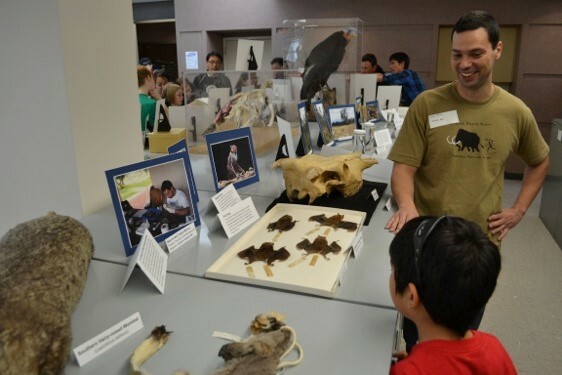 Felipe Martins, an MVZ Post-Doc, tells a young visitor all about vampire bats. (Photo by Jeremy Chase Crawford, 2014). 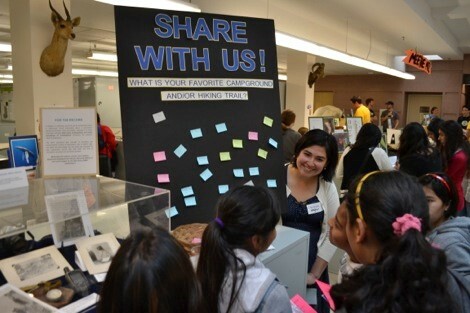 MVZ graduate student Rachel Walsh, spent Cal Day engaging visitors with her Yosemite habitat game. (Photo by Jeremy Chase Crawford, 2014). 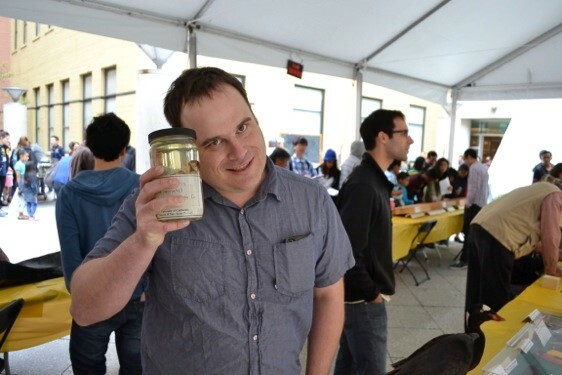 MVZ graduate student Mike Holmes shows off a two-faced cat specimen in the VLSB Courtyard display. (Photo by Jeremy Chase Crawford, 2014). 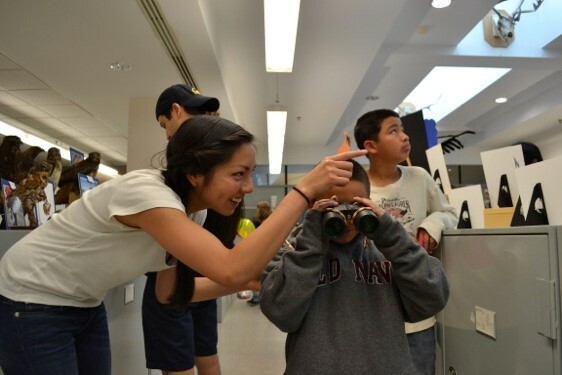 Undergraduate volunteer Marcie Nakatsuchi teaches a young visitor how to use binoculars. (Photo by Jeremy Chase Crawford, 2014).